India and Bangladesh will sign at least 25 pacts covering an array of areas including defense and civil nuclear sector during Prime Minister Sheikh Hasina’s four-day visit here beginning tomorrow but progress over the long-pending Teesta water-sharing agreement is unlikely. The MoUs likely to be signed after talks between Prime Minister Narendra Modi and Hasina on Saturday include one on boosting defense ties under which India will supply military hardware to Bangladesh. Under a first such MoU with any neighboring country, India is also set to announce a line of credit of USD 500 million to Bangladesh for military supplies. The framework agreement on civil nuclear energy will provide for extensive cooperation in the sector including setting up of nuclear reactors in Bangladesh by India. “It will be a very very special visit. We hope the visit will take the ties between the two countries to the new level,” Sripriya Ranganathan, Joint Secretary in the Bangladesh- Myanmar division of External Affairs Ministry, told reporters. 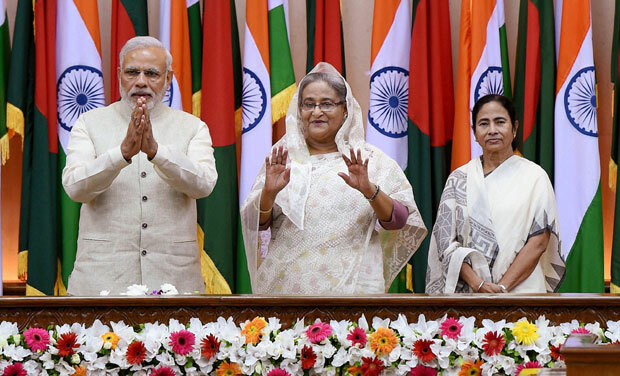 Issues, like combating terrorism, containing radicalism and enhancing security cooperation between the two countries, are likely to figure prominently beside stalemate over the Teesta pact during talks between Modi and Hasina. It is learnt that the central government will not go ahead with the agreement without taking West Bengal Chief Minister Mamata Banerjee on board. Banerjee has been opposing it stridently citing water crisis in West Bengal. “It will be a visit without water,” described an official in the know of things. The West Bengal Chief Minister has accepted an invitation by the government to attend the launch of some projects between the two countries as well a lunch to be hosted in honor of Hasina by Modi. The issue of Teesta is likely to figure during Banerjee’s interaction with Hasina. “Teesta agreement remains a work in progress… We have not reached a closure on it,” said Ranganathan. The Teesta deal was set to be inked during the then Prime Minister Manmohan Singh’s visit to Bangladesh in September 2011 but was postponed at the last minute due to objections by Banerjee. Teesta water is crucial for Bangladesh, especially in the leanest period from December to March, when the water flow often temporarily comes down to less than 1,000 cusecs from 5,000 cusecs. It will be Hasina’s first bilateral visit to India in her current term as prime minister. She will be staying at the Rashtrapati Bhavan. The two prime ministers will launch a bus and a train service between Kolkata and Khulna. The two sides are likely to also finalize an agreement on the long-term supply of diesel to Bangladesh from India besides holding preliminary talks on linking India’s gas grid with that of Bangladesh. On the agreements, Ranganathan said another pact on formalizing regular defense engagements will also be linked.